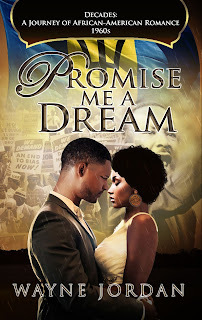 Promise Me A Dream by Wayne Jordan is the seventh book in the Decades: A Journey of African American Romance series. This series consists of 12 books, each set in one of 12 decades between 1900 and 2010. Each story focuses on the romance between African American protagonists, but also embraces the African American experience within that decade. Join the journey on our Facebook page, http://bit.ly/2z9sMrd. The 1960s was the decade in which I was born (I was born in 1962), and although my memories of that time are vague, that decade has always intrigue me. So, it was only natural that when I conceived this project, I chose the 1960s. With each of the books in this series, I wanted to give readers, not only a great love story, I also wanted to give them a glimpse of the decade – the good, the bad and the ugly. And there was much about this decade that was bad and ugly. Dr. Martin Luther King Jr. and the Civil Rights Movement are synonymous with the decade. It was only in my late teens that I remember my heart breaking, bit by bit, when I discovered what blacks in the United States had continued to endure and suffer during that decade, despite the abolition of slavery. I lauded the courage of those individuals who fought for respect, equality and justice. Although I lived in Barbados, the impact of Dr. King and The Movement reached our shores. Ironically, it was during this turbulent time, that many Barbadians sought a better life in the Big Apple, as my grandmother did and as you will see my heroine do. But all about the 1960s was not bad and ugly. There was much good. Blacks were continuing to excel in sports, the arts, education, politics, in all areas. Most important was the sense of pride in being black. These themes will all play an important part in Promise Me A Dream. I hope you will enjoy my story as much as you have enjoyed the others. Below is the blurb of the story. 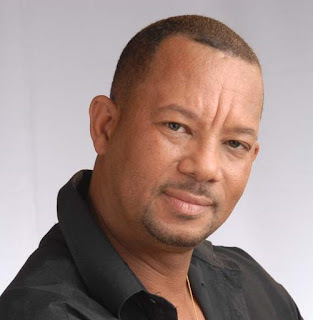 Chandra Williams’s dream of becoming an actress carries her from her home on Barbados to the bright lights of Broadway. But it’s the 1960s, and her goal of gracing the stage is obstructed by the limited opportunities for black actresses. Driven to help end discrimination and inequality, Chandra joins the Civil Rights movement. Joel Donovan doesn’t understand the need for the Civil Rights movement. His life of privilege has sheltered him from the struggles of the black community. However, he’s intrigued by the courage and commitment of the beautiful immigrant from Barbados. Their attraction is immediate and powerful, and Joel is persuaded to join the movement. When their efforts result in Joel’s freedom being challenged, Chandra gives him her unwavering support, but can their growing love survive the racial tensions and conflicts of the times? Wayne Jordan is an award-winning author of contemporary romance. He’s also high school teacher. He lives on the beautiful tropical island of Barbados, the settling for several of his romance novels. 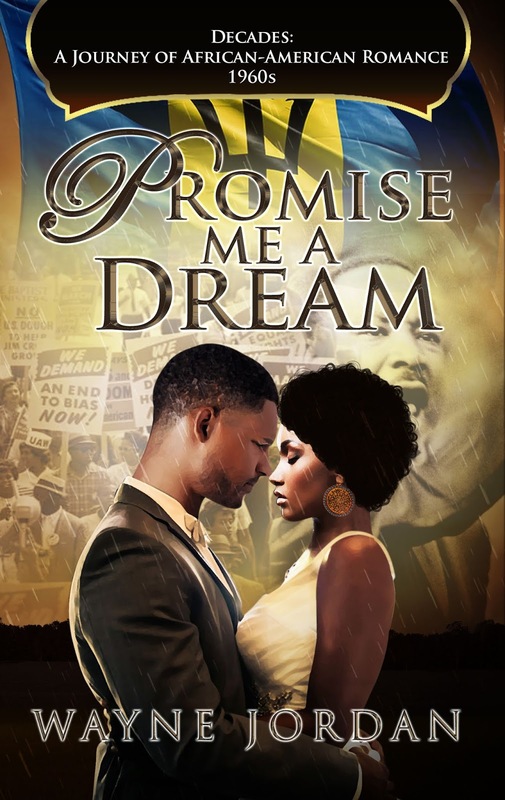 His 11th romance novel, Promise Me A Dream, is a July 2018 release, and will be available for preorder in print and ebook in June 2018. This series is so groundbreaking and important, Wayne! I am enjoying learning about 'recent' history from a different point of view. Some things I guessed would be true are not,and some that I never imagined are true. Allowing readers to experience history through Story is an amazing gift. Choosing the Historical Romance genre gives the reader a deeply emotional experience that leaves them hopeful for the future. I'm sorry you must deal with a major health issue while on deadline, Wayne. So glad you are recovering and writing! Wayne, I echo Sarah's comments and will add that Romancing The Genres is so delighted to have the Decades: A Journey of African-American Romance books and authors featured here. Sending healing thoughts for your full recovery and many more books to come. Judith: Thanks so much for having us. Recovery hasn't been easy, but I was determined to work had and recover quickly...while taking things easy. I have accomplished that. Oh my goodness!! I have been searching for the release of your book since the beginning of July, as I have read the 'Decades' series since it began. Now I know the reason for the delay and I wish you the best in your recovery!! I am all too familiar with strokes since my sister had one in February 2012 and her daughter followed and had a massive stroke in August 2012 - what a year that was! I was like a tennis ball going back and forth between the two to see to their needs. They are both doing better now. May the Lord Bless You! I'm really sorry about the delay of the book. I'm not done yet, but I am working, despite the limitations, to have it done. Typing is a lot more difficult that I thought and it my right side which was affected (I am right handed). Unfortunately, 1970s we be out before mine is, but I am sure you will enjoy Keith's book. I will be sure to let you known when PROMISE ME A DREAM goes on sale. It will be sometime in August.